In an Inlander story two weeks ago, we wrote that, because of the way Washington state election law was written, conservative activist Glen Morgan just might get away with those deceptive mailers that told progressives, "Don't be fooled by fake progressive Jessa Lewis ('D' Spokane)" and urged them to write in "real progressive Joe Pakootas" for the 6th Legislative District. And initially, that's the conclusion the Public Disclosure Commission came to: What Morgan did may have been sleazy, but it probably wasn't illegal. Just to make sure, the PDC sent a letter to the attorney general asking for a second opinion. "We conclude that [the Washington state code] does not prohibit the alleged conduct in these matters, even assuming the allegations are true," writes Peter Lavallee, executive director Public Disclosure Commission, in his letter to the attorney general. 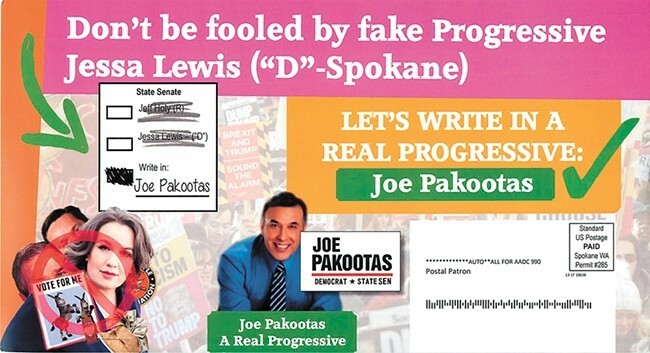 The progressive advocacy group Fuse Washington argued that, in its mailer against Lewis, Morgan deceptively lifted a Fuse quote endorsing Pakootas in 2016 — when he was running against Rep. Cathy McMorris Rodgers — and repurposed it to falsely make it look like Fuse was endorsing Pakootas instead of Lewis this year. But there was the rub: Joe Pakootas wasn't technically a candidate this year. "The mailers do not include an express false statement of material fact about a candidate," Lavallee writes. "They do not directly or indirectly falsely claim that a candidate has the support of a person or organization." While the ad falsely implies that Fuse didn't endorse Lewis, there's technically no law against lying by saying someone didn't endorse a candidate when they did. "Whether or not a restriction on 'negative endorsements' would constitute good policy, our job is to apply the law as we find it, particularly in the area of free speech — and political speech at that," Lavallee writes. In the letter, Lavallee asked the Attorney General's Office to assess whether their reading of Washington state election law was correct. "These complaints raise serious issues related to the conduct of elections," Lavallee says. "The PDC... respectfully requests that the Attorney General's Office render an informal opinion as soon as practicable to endorse or clarify our interpretations." And if the mailers were legal? Lewis says the Legislature should consider remedying that. "The Legislature has a lot on its plate for this session, but I would expect and would ask for integrity and transparency in both our elections and in how they conduct business to be a priority," Lewis says. But did the mailers work? Did they manage to trick anybody? They might have in some small ways, though it's far from clear. There are a couple of ways the mailers may have worked. First, they could have convinced a number of progressive voters to write in Joe Pakootas instead of voting for Jessa Lewis. Second, they could have convinced progressive voters that there are no good options in the race, and convince them to simply leave the choice blank. And finally, a bunch of media outlets running stories insisting that, no, in fact, Jessa Lewis is progressive could have hurt her with moderate voters, hurting her overall. We put each of these hypotheses to the test, but the evidence that mailers made much of an impact is minimal. Let's start with write-ins. 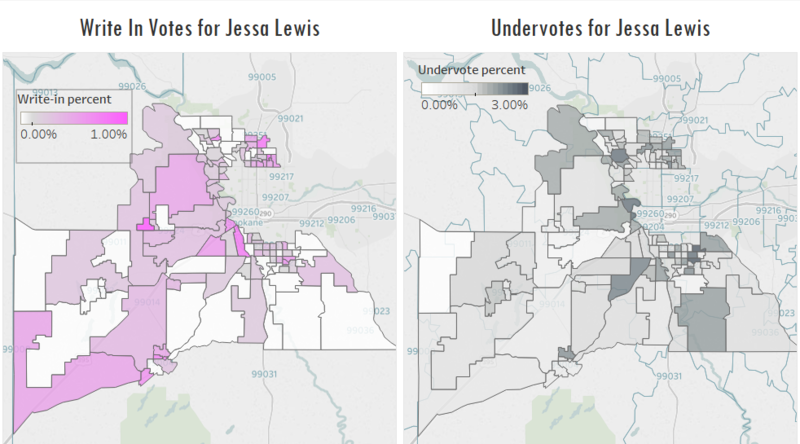 Here, you'll find the most persuasive evidence: You see that only 71 voters wrote in candidates for the two other 6th Legislative District races, or while 125 voters voted for a write-in candidate rather than voting for Jessa Lewis or Jeff Holy. But that's still less than the number of 6th District write-in candidates in Lisa Brown's race. And 125 votes represents less than a third of a percentage point of the ballots turned in. So what about undervotes? 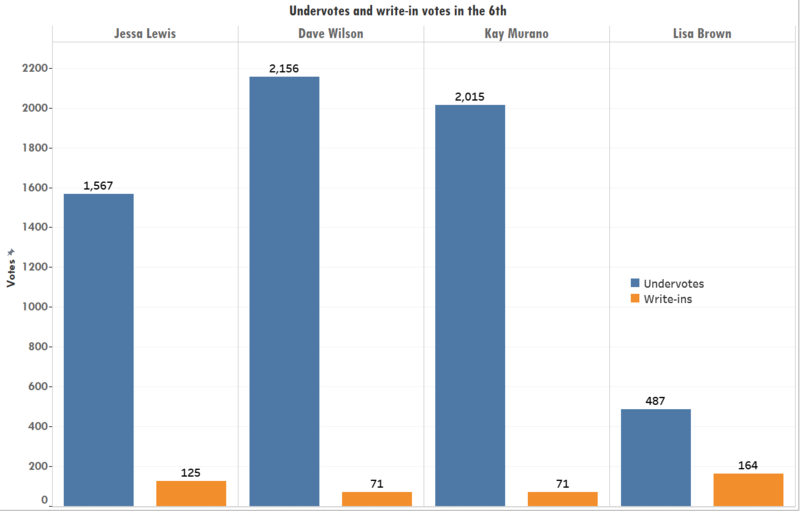 In fact, Lewis' race had significantly fewer undervotes than Kay Murano or Dave Wilson's races in the 6th. Finally, let's look at what happened to the Democratic vote totals from the primary to the general. While there are still about 40,000 votes left to count, Lewis so far has ended up with the worst final result of the legislative candidates in the 6th, getting less than 45 percent of the vote. Since the Dave Wilson primary race included another Democratic candidate, we've added it onto Dave Wilson's total in the primary to more accurately represent the electorate. 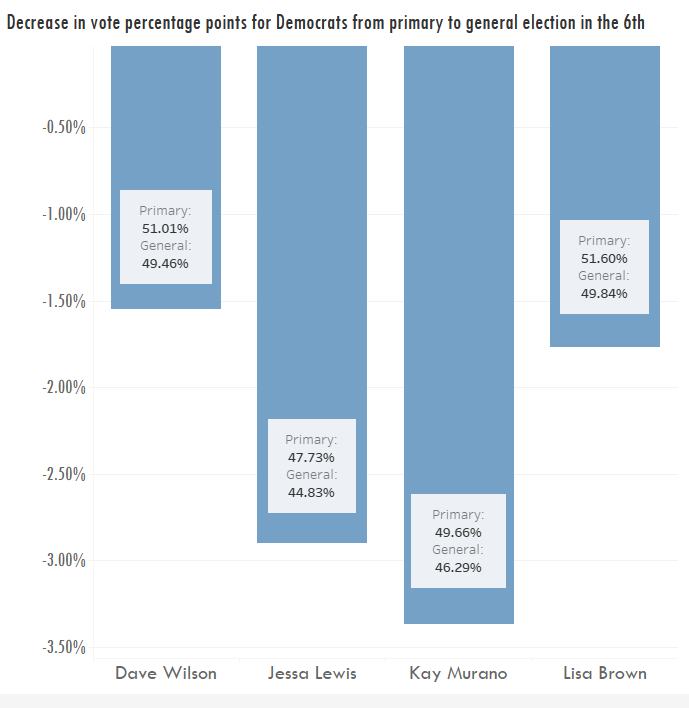 Still, 6th District Washington representative candidate Kay Murano had a steeper drop from the primary than Lewis. You could argue that a handful of votes were changed by the mailer, one way or another. But with a 10-point victory margin for Holy, they didn't come close to swinging the election.